Extremely rare early Mexican map of San Diego. Only four known examples! This is an exceptionally rare and early map of San Diego Bay, California, and San Blas, Mexico, published in 1825 by order of Senor Don Guadalupe Victoria, the first president of the Republic of Mexico. 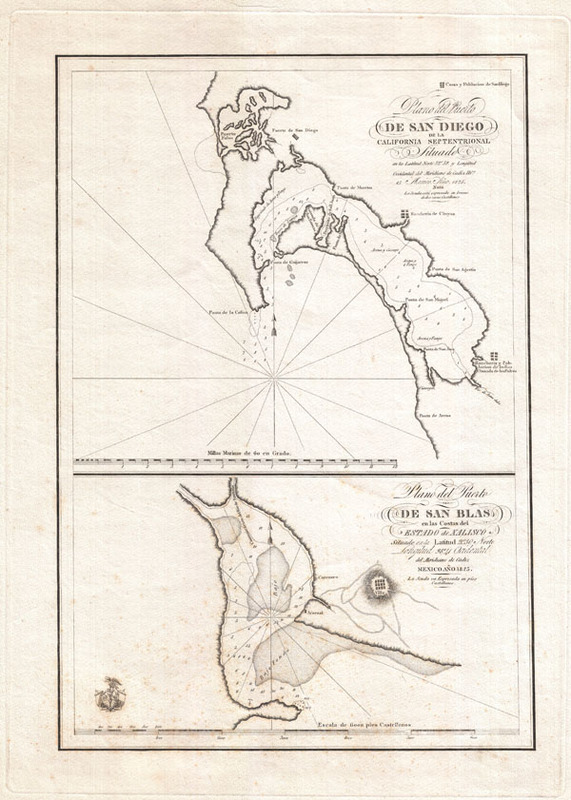 Essentially two maps on a single sheet, this map highlights the starting point (San Blas) an ending point (San Diego) of the Spanish supply route to southern California. The upper map focuses on San Diego Bay, covering the region from Puerto Falso (Mission Harbor) to Punta de Arena. The fortress of San Diego (the Presidio), the Ranchera de Choyas, the Poblacion of San Diego (Mission of San Diego), and a ranch and Indian village in the southwestern part of the bay, among other sites, are all noted. The lower map, focusing on San Blas details the Bay from the Rio de Santiago to the village of San Blas, today a small fishing village near Puerto Vallarta. Both maps offer numerous depth soundings, references to shoals, reefs, and other undersea dangers, and notes on anchorage. The armorial crest of Mexico appears in the lower left quadrant. Though ostensibly similar to the map of the same regions published by Perouse in his 1797 atlas, this is in truth a different map with the apparent similarity stemming from the fact that both maps are drawn from the same source – the pioneering cartography of Juan Pantoja y Arrianga. Pantoja was the navigator and cartographer of the Frigate Princesa, which was commissioned, in 1782 to supply Spain's few colonial outposts along the remote California coastline. The Princesa sailed from the harbor of San Blas to San Diego where, during a seven week break, Pantoja produced the first accurate survey of San Diego Bay. Pantoja's work remained in manuscript form until 1802 when it was published to illustrated Espinosa and Tello's Relacion Del Viage Hecho Por Las Goletas Sutil Y Mexicana En El Ano De 1792. Around this time the Spanish government, looking to firm its holdings on the California coast, commissioned a series of nautical charts based on Pantoja's work. The 1810 El Grito, which set off the Mexican Independence movement, halted most Spanish financed map publication work in the Americas. It was left to Mexico's first president Senor Don Guadalupe Victoria to resurrect Spain's abandoned cartographic effort and finally publish this important map series. The Los Angeles Bookseller Jake Zeitlin claimed that this map was published in London by John Arrowsmith. While Arrowsmith's name does not appear on the work, the quality of the paper and the exceptionally fine engraving is definitely suggestive of a well-established European publishing house. No similar work of this quality is evident from either Mexican or American publishers of the period. This map is extremely scarce and we know of only four other examples in institutional collections: the Bancroft Library, The Huntington Library, the University of Arizona, The Map & Atlas Museum of La Jolla, and the U.C. San Diego Campus Library. Guadalupe Victoria (September 29, 1786 - March 21, 1843) was a Mexican politician and revolutionary who fought for Mexican independence from Spain in the Mexican War of Independence. Following the War of Independence Victoria was elected the first president of Mexico. His political achievements as president of Mexico include the normalization of international diplomatic relations with Europe, the abolishment of slavery in Mexico, the creation of the National Museum, and formalized the Mexican-U.S. Border. Victoria was the only President who completed his full term in more than 30 years of an independent Mexico He died in 1843 at the age of 58 from epilepsy in the fortress of Perote, where he was receiving medical treatment. On April 8, of the same year, it was decreed that his name would be written in golden letters in the session hall of the Chamber of Deputies. His mortal remains are interred, along with those of fellow Mexican heroes Miguel Hidalgo and Jose Maria Morelos, beneath El Ángel de la Independencia, a monument on the Paseo Reforma, Mexico City. Juan Pantoja y Arriaga (fl. c. 1779 - 1792) was a Mexican cartographer and navigator active in the late 18th century. Pantoja is best known for his work onboard the Frigate Princesa. The Princesa, of which Pantoja was the navigator, was a supply ship commissioned to make the annual supply run between the naval base of San Blas and Spain remote border fort, San Diego, along the California Coast. During a seven month lay-over in San Diego Pantoja produced his most famous map, the first reasonably accurate survey of San Diego Bay. Though composed in 1782, Pantoja's map remained in manuscript form until it was finally published in 1802 to illustrate Espinosa and Tello's Relacion Del Viage Hecho Por Las Goletas Sutil Y Mexicana En El Ano De 1792. Today Pantoja's efforts are commemorated in San Diego by Pantoja Park. Built in 1850, Pantoja Park is downtown San Diego's oldest public recreation area. Very good. Light foxing in lower quadrants. Original pressmark visible. Wide clean margins. Wagner, H.R. Cartography of the Northwest Coast of America to the year 1800 848 (Perouse Map). Harlow, N., Maps of the Pueblo Lands of San Diego, 12.